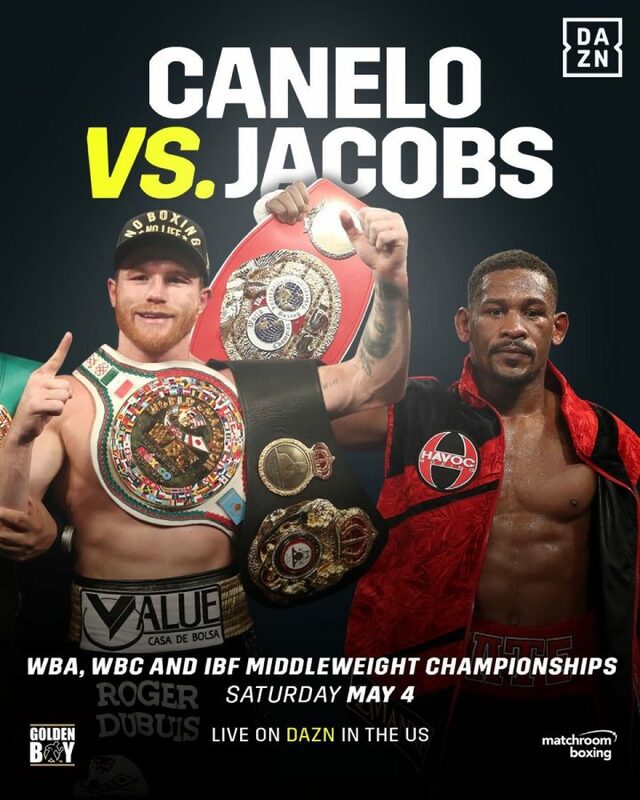 By Sean Jones: Golden Boy Promotions CEO Oscar De La Hoya made it official moments ago, that Saul Canelo Alvarez will be facing IBF middleweight champion Daniel Jacobs on May 4 on DAZN. What’s interesting is that Golden Boy Promotions haven’t revealed the location for the Canelo vs. Jacobs fight yet. It was previously reported that Golden Boy had already booked the T-Mobile Arena in Las Vegas, Nevada for the May 4 date for Canelo to fight. Those guys are all heads and shoulders above Jacobs in the talent department right now in this view of this writer. These are the guys that Canelo should be fighting, but he’s decided to take the arguably easier path in facing Jacobs, who looked absolutely terrible in his last two fights against Sergiy Derevyanchenko and Maciej Sulecki. Jacobs is almost looking shot now since his fight with Gennady Golovkin in 2017. This is a good deal for DAZN, considering that it’s going to increase their subscription rates considerably, but obviously not nearly as much as a third fight between Alvarez and Gennady Golovkin. That’s the fight that boxing fans want to see. For Jacobs, it’s too bad that Canelo is no longer fighting on pay-per-view, because there would have been a lot of money for him to make if the two of them fought on PPV. It’s unclear how Jacobs can get the money from DAZN that would get if this fight were staged on PPV. Jacobs, 5’11”, has the size and the jab to get the better of the much shorter 5’8″ Canelo. He has the blueprint that GGG and Floyd Mayweather Jr. used to get the better of Canelo. However, as boxing fans saw in GGG’s two fights with Canelo, you don’t beat him by out-boxing him the way fighters normally do. Canelo is a special case. He’s very popular, so you’ve got to trounce him basically Mayweather did in order to get a decision win. Golovkin appeared to beat Canelo by a 9 rounds to 3 score in the first fight with him in 2017, and yet the judges scored it a 12 round draw. For Jacobs to beat Canelo, he’s probably going to have to knock him out, because getting a decision over him may prove to be impossible. If GGG couldn’t do it, then that tells you a lot about how difficult it is to get a decision against the highly popular Canelo. This is the same venue where Canelo twice has been involved in controversial decision fights against Gennady Golovkin. Many boxing fans saw Canelo being saved from losses by the judges from that state. Las Vegas is also the city where Canelo beat Erislandy Lara by a controversial decision in 2014 in a fight that a lot of fans saw the popular Mexican star losing. The question now is whether Jacobs’ promoter Eddie Hearn of Matchroom Boxing insist on the fight against Canelo taking place in a neutral venue outside of Nevada? Jacobs is from New York, and that’s where his fan base is. If Golden Boy wants to take advantage of Jacobs’ large fan base, then a fight in New York is the way to go. Of course, if Golden Boy feels like Canelo needs to fight in Las Vegas due to his recent track record in his controversial decisions against GGG and Lara, then they might insist on taking it back to that city in hopes that he can win. Jacobs is getting a little carried away with himself. Beating Canelo won’t prove that Jacobs is the best fighter in the middleweight division. Jacobs still has GGG problems, as he lost to him in 2017 by a 12 round unanimous decision in New York, and he never avenged that loss. Instead of avenging it, Jacobs told everyone that was willing to listen to him that he won the fight. It was more than a little sad, as it gave the impression that Jacobs was a poor loser, and unable to accept when he’s been beaten. It’s tough for fighters to improve when they won’t admit that they lost, and they continue to tell fans that they should have won. The fact of the matter is, Jacobs skipped the IBF’s secondary weigh-in on the day of the fight, and then was knocked down in round 4 and ran from GGG in the first six rounds. When Jacobs finally start fighting hard, he was too far behind in the fight to win without scoring scoring knockdowns, which he failed to do. Jacobs won’t be the best middleweight in the division if he beats the 5’8″ Canelo. He’ll still have GGG problems, as well Canelo, who is seen as a fighter that was given gift decisions in his two fights against Golovkin in the eyes of a lot of fans. Canelo (51-1-2, 35 KOs) will have his WBA/WBC middleweight titles up for grabs when he faces IBF champion Jacobs (35-2, 29 KOs) in a unification fight. The winner of the Canelo vs. Jacobs fight will hold three of the four titles at 160. The only belt that will still be out of the winner’s grasp is the World Boxing Organization title, which is held by Demetrius ‘Boo Boo’ Andrade (26-0, 16 KOs), a fighter that Hearn promotes as well. It should be a cut and dried thing for the Canelo-Jacobs winner to fight Andrade next with all four middleweight titles on the line. However, if Canelo loses to Jacobs on May 4, then it’s highly likely that a rematch will take place between those two fighters before the winner moves on to face Andrade. Knowing Canelo, he’s the type that will keep fighting Jacobs until he finally beats him. It would be a horrible move career-wise for Canelo if it turns out that Jacobs has his numbers, and beats him two or three times in a row, but that’s what happens sometimes when a fighter has a lot of pride. That can sometimes derail a fighter’s career when he fails to understand his own limitations. Canelo’s controversial decision fights against GGG already showed his limitations. Those fights might have had different outcomes with a different set of judges. Hearn believes that Jacobs should be seen as a huge inspirational story because he’s come back from medical problems that briefly derailed his career nine years ago. That was so long ago, and most casual boxing fans are busy their lives, and they take the interest to study the background of fighters like they might elsewhere in the world. U.S fans have busy lives, so Jacobs’ life story hasn’t caught on with the casual boxing fans enough for it to make them want to see him fight just because of that. The fans want to see entertainment. The fighters’ outside the ring lives are less important. Jacobs is a good fighter, but perhaps not as good as Jermall Charlo, Canelo’s WBC mandatory challenger, who the World Boxing Council is trying to get Golovkin to take care of instead of ordering him to deal with him. Charlo and Matt Korobov would likely have to be seen as better fighters than Jacobs right now. Jacobs barely won his last two fights against Sergiy Derevyanchenko and Maciej Sulecki. Those fights showed that Jacobs is not the same fighter that he once was after taking punishment in his loss to GGG in 2017.